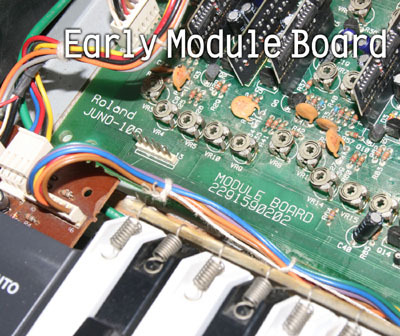 This procedure will walk you through the process of calibrating (tuning) a Roland Juno-106 (or HS-60) synthesizer. 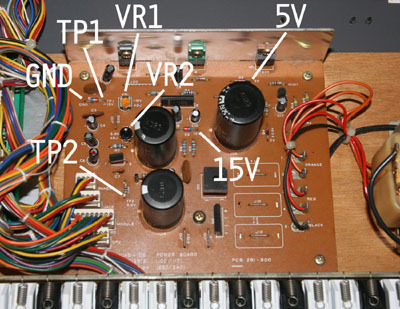 It requires a voltmeter, a frequency counter or tuner, and an oscilloscope. It also requires working on the keyboard with the power on and the power supply exposed, so this calibration should not be attempted unless you are confident in your abilities to work safely, and to use the necessary equipment. 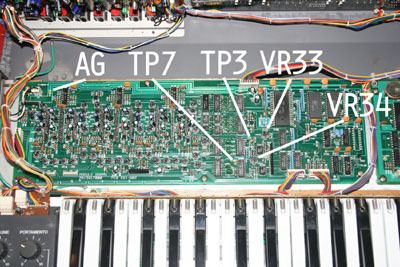 Note that any time you replace a voice chip on your synthesizer, you will need to recalibrate at least that voice. Make sure the keyboard has been powered on for at least 10 minutes to warm up prior to any calibrations, and perform the calibration steps in the order they are listed here. 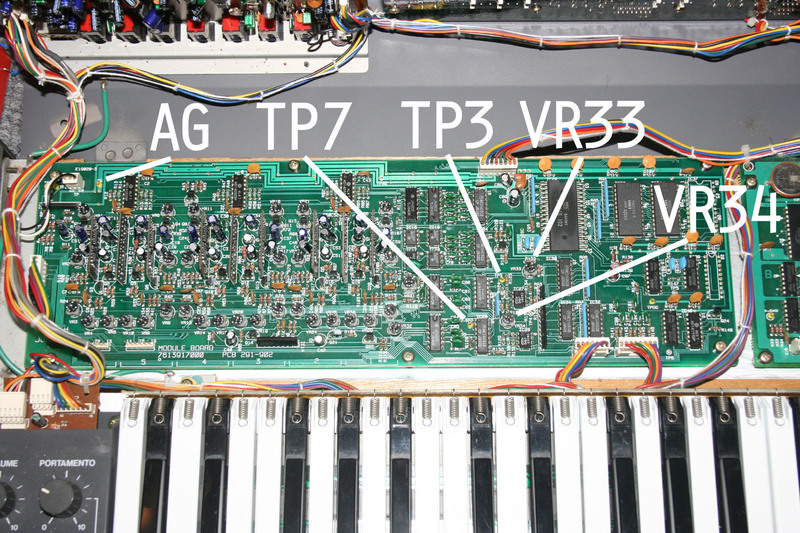 Power on the Juno-106 while holding down the KEY TRANSPOSE button; this will put the keyboard in Test Mode. The display will read ‘-_’. Press the Poly 1 and Poly 2 buttons together, and now for each note played, the display will show which voice is sounding ('-1' through '-6'). Use a voltmeter, grounded to GND (the diode at left rear corner of PS board). Measure TP1 (opposite leg of diode). Adjust VR1 for -15VDC. Measure TP2. Adjust VR2 for +5VDC. Verify +15VDC at ‘15V’. You cannot adjust this. Verify +5VDC at ‘5V’. You cannot adjust this. Measure the voltage at TP7. It should be between +0.25 and +0.27V. Adjust VR34 if necessary. Ground the oscilloscope lead to the analog ground (AG) at the left rear of the module board. Clip onto TP8 (TP8 though TP19 look like two unused connectors on the left front of the board). Press the Bank 1 button on the panel. (This loads the correct program for this test.) Play a note, and make adjustments for the minimum (smallest amplitude) reading on the oscilloscope. Press the Bank 3 button on the panel. Play middle C (you don’t need to hold it down), then use the oscilloscope to observe the amplitude of each voice. They should all be identical, and should read 4.8V peak-to-peak. (NOTE: If you have installed Analogue Renaissance Gravitational Slingshot voice chips, they require 2.4V p-p calibration). The early module boards (shown at left) did not have the row of test points 14-19. 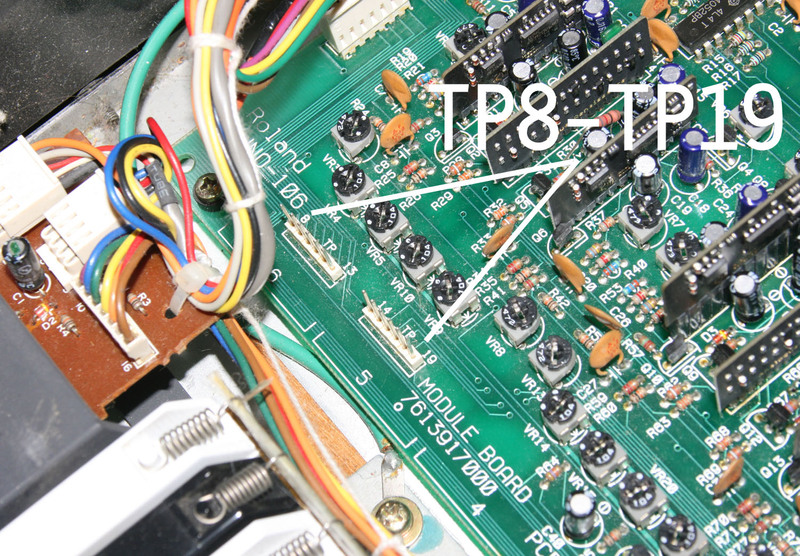 Instead, you will need to connect to the center pin of trim pots, as indicated below. Press the Poly 1 button. 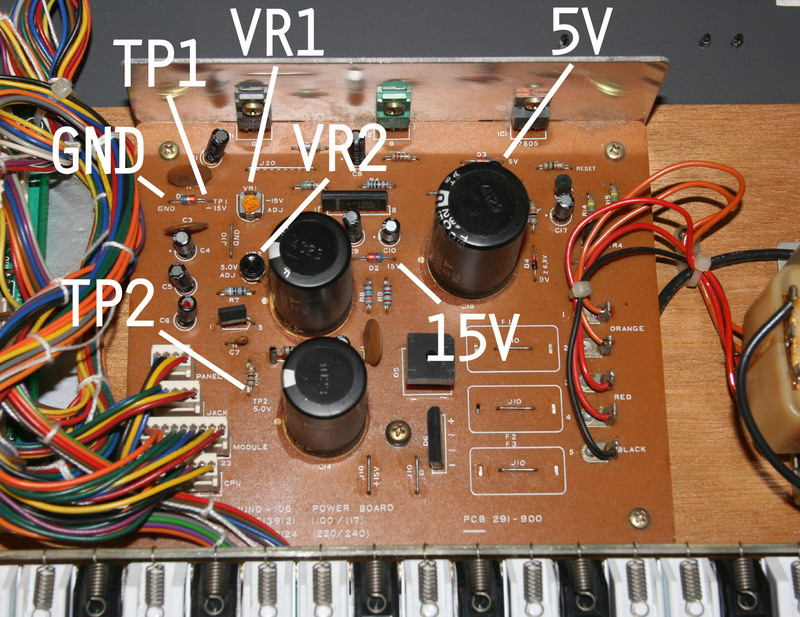 Hold down (or tape down) middle C, and use the oscilloscope to observe the amplitude of each voice. They should all be identical, and should read 6.0V peak-to-peak. (NOTE: If you have installed Analogue Renaissance Gravitational Slingshot voice chips, they require 3.0V p-p calibration). Play middle C, and measure the frequency of each voice at the test points below; adjust to make each read 248Hz. You can use a frequency counter for this (some multimeters have frequency counters), or you can play through speakers and use an iPhone app such as Fine Tuner. Now play the C two octaves up from middle C, measure the frequency of each voice, and adjust each to read 992Hz. Press the Bank 6 button. Playing any key should produce white noise. Use the oscilloscope to see the noise at TP8, and use VR32 to adjust the amplitude to 4V p-p.
Press the Bank 5 button. Play middle C, and use the oscilloscope to observe a square wave from each voice. Confirm that each voice shows a 50% duty cycle (the upper and lower peaks of the wave should be identical in length). Now, slide the PWM knob on the panel to 10, and confirm that each voice shows a duty cycle of about 95% (one peak very long, the opposite peak just a narrow spike). The six voices are now all calibrated. Press the Manual button, and as you cycle through the voices, they should sound identical in pitch, loudness, and timbre. The filter is now calibrated as well, and you can test this by turning the pulse and sawtooth off, and setting the suboscillator and noise all the way down. Now, make the filter self-oscillate by setting the resonance fully on - you should now hear a sine wave sound, and the FREQ slider will control its pitch. Set the VFC ENV and LFO sliders all the way down, and with the VCF KYBD slider fully upward (this opens the filter to match the keyboard tracking), the filter should play chromatically as you play the keys.